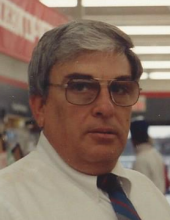 Robert Allan Mangum, 83, of Fayetteville, Georgia passed on Wednesday, March 20, 2019. Born on September 12, 1935 in Atlanta, GA, Robert (Bob) lived most of his young life in East Point, GA before retiring and living out his life in Fayetteville, GA. Robert was a member and an Elder of The Church of Jesus Christ of Latter Day Saints, Fayette Ward. Robert retired from Sherwin-Williams Paints after 43 years of service. He was a Veteran, serving in the National Guard. He was a loving husband of over 60 years to Carolyn Lanier Mangum. Robert is survived by his wife, Carolyn and sister, Elaine Mills. Robert was a devoted father to son, Robert Mangum Jr. and daughter, Robbie Bagley. He is also survived by grandchildren, Crystal Mangum and Steven Bagley; step-grandchildren, Michelle Korb and Brian Lueke; and six step-great-grandchildren, Cadence, Logan, Linleigh, Melody, Leo and Levi. A graveside service will be held at Camp Memorial Park, 1095 Hwy 54 East, Fayetteville, GA 30214 on Saturday, March 23, 2019 at 11:00 AM. In lieu of flowers, memorials may be made to Brightmoor Hospice, 3247 Newnan Rd., Griffin, GA 30223. To send flowers or a remembrance gift to the family of Robert Allan Mangum, please visit our Tribute Store. "Email Address" would like to share the life celebration of Robert Allan Mangum. Click on the "link" to go to share a favorite memory or leave a condolence message for the family.